Favorite room is definetly the kitchen! 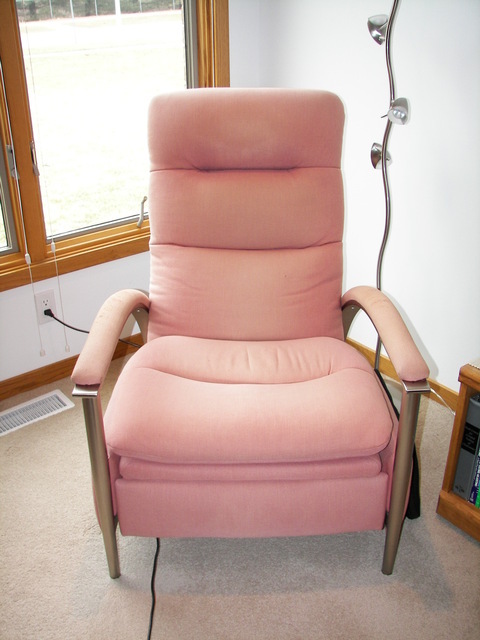 We love our re-upholstered Recliner Chair in our Den. Also one of our favorite accessories is our massage chair in the living room. We bought three oak vanities for our bathroom including custom ordered cultured marble counter tops from Abode Building Center. The cabinets are premium quality and the counter tops came out extremely nice with just the right "swirl" like we wanted it. Very satisfying experience. Would give rating of 10 if sales person would have been a little more attentive (we waited for about 20 minutes to actually ask questions), but after that everything went like planned and delivery was on time. We also considered buying our kitchen from here but they were much too pricey compared to other kitchen stores. We ordered 14 custom made blinds from Spring Crest and installed them ourselves. The prices are on the higher side for everything in the store. One blind had to get re-ordered because it was not cut to the given measurement. The blinds turned out fine and most of them are working fine. A few plastic pieces at the strings broke but when we went to Spring Crest and told them about it, they instantly gave us replacement parts at no cost. We bought our granite tiles from Tile Mart and they were delivered when promised. They do offer a list of contractors who will lay tile for you, but we did not use any of their contractors. The store is very large and has many tiles and stones to offer. Very nice and down-to-earth sales person gave us small samples of tiles home to look at the colors and decide on tiles. Best price on granite tiles we could find. Very satisfying experience. We ordered two glass doors for our showers and two large bathroom wall mirrors at Dave's Glass Service. They were delivered when promised and mounted quickly and without any problems. Very nice quality and great customer service. We had our whole yard done by Lamons Landscape Inc. including planting of 4 trees, 20 yards of river stone, burying all downspouts, putting down aluminum edging, placing boulders and hydro seed lawn area. My husband and I designed the flower beds and decided where we wanted the edging and rocks placed. We kind of had to watch over the workers to make sure things got done the right way. Some things that went wrong were easily fixed, others just did not get done the way we wanted it and they stayed that way (like cutting off the downspouts way too short and now it is an eye sore to us). Would recommend this company because overall the work was done well and in a timely manner. 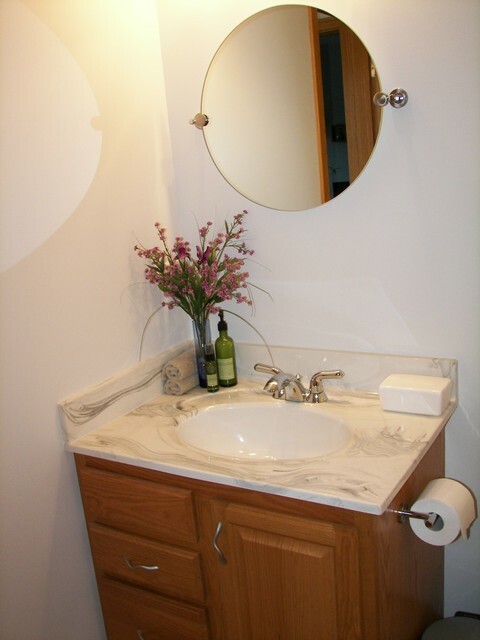 We bought our Granite Counter tops at Granite Works and had them installed by them. Very nice and friendly service, great quality and precise installation. The owner actually walked through the back of the store with us and showed us any Granite Slab we wanted to look at. After ordering one we received a call to come to their store to look at the granite and if we would not like the grain or pattern in the slab, they would get a different one for us. Super quality, very quick installation, perfect seams up to this day. They suggested to use the left over granite throughout the house and we now have matching granite ledges in kitchen and entry area. Absolutely satisfying experience. We had our recliner chair re-upholstered and it came out beautifully. We sent pictures of our chair by email and got a response with an estimate within a week. When dropping off the chair and picking out fabric the owner and employees were extremely friendly and helpful. It took about a month to get the chair back but it was well worth the wait. Very nice attention to detail and exactly lik we wanted it done. The chair looks better than ever! Professional Customer Service, efficient installation of Underground Sprinkler System with over 40 sprinkler heads, blowing out before Winter and start-up in Spring were ok. Very friendly and quick when we needed replacement of a broken sprinkler head. We continue to use their Service and can definetly recommend.